Another silent feature among this year’s crop is the social issue melodrama Love or Justice (1917), a Thomas Ince production about a substance-abusing lawyer and his redemption by a woman from the underworld. Several decades forward, the height of the American independent film renaissance is represented by two landmark diary films: Ed Pincus’s Diaries (1971–76) and My Girlfriend’s Wedding (1969) by Jim McBride. Performance art is exemplified by Solo Olos (1978), a newly discovered performance by the late Trisha Brown, as filmed by Babette Mangolte, and 16 Millimeter Earrings (1979), a celluloid recreation of Meredith Monk’s multimedia solo performance. 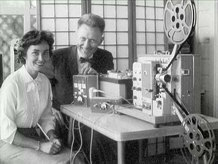 Medical and scientific films are also well represented, starting with The Inner World of Aphasia (1968), an innovative medical training film on treating patients unable to communicate verbally, which was named to the National Film Registry in 2015. Other research works include dance analysis films using the “Choreometrics” method developed by Alan Lomax; pioneering heart-surgery footage from Johns Hopkins University; and rare footage of “Booming Ben,” the last surviving Heath Hen, filmed shortly before he and his species went extinct in 1932. Diaries (1971–76), Ed Pincus’s self-reflexive portrait of five years of marriage and family life, will be preserved by the Harvard Film Archive with support from the NFPF. Among this year’s crop there are also sponsored films promoting the reelection of Montana Governor J. Hugo Aronson, the “Galloping Swede”; tourism in Adirondack Park; and the Pulitzer prize-winning scoops of the Chicago Daily News. Home movies are represented through collections on topics ranging from the life and work of the sculptor Cornelia Chapin to the champion racehorses Man O’ War and Durbar II, to the 75th Infantry Airborne Ranger Reconnaissance Team in central Vietnam, and more. For a full list of the 2017 grant winners, click here. The grants are made available thanks to the Library of Congress and provide support to create a film preservation master and two access copies of each work. Since its creation by Congress in 1996, the NFPF has provided preservation support to 292 institutions and saved more than 2,350 films through grants and collaborative projects.